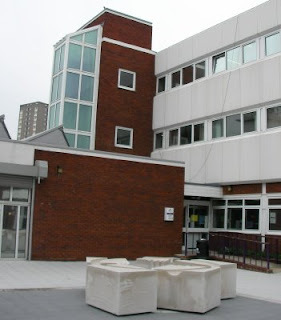 Last week I visited the Department of Mathematics at Portsmouth University (pictured above). I was invited to do so by Nira Chamberlain, who is studying part time for a PhD there. I met with staff in the Department and visited the Purple Door (pictured below), where the careers service is based. 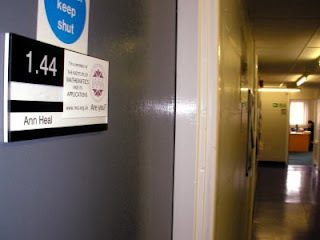 The Mathematics Department has just moved into a new building and is rare in my experience in that in recent years it has been successful enough to split away to form its own Department where many mathematics departments are finding they are being swallowed into larger departments. I travelled to Portsmouth and back in a day from Nottingham. This was a bit of an experiment. The travelling was 4 hours each way and I had about 4 hours in Portsmouth. I think this went well, my trip was sufficiently well organised so I could make effective use of that time. This meant I didn’t have the trouble of staying a night away from home and the IMA didn’t have to pay for the hotel, which is a bonus. I don’t think a trip over such distance would be possible in all circumstances but in this case I feel it worked well.